You're looking at the old site! Africanhiphop.com has been RESTYLED and the new site can be found here. This section is kept online for archival purposes only and is not updated! The song 'Beyonce Coulibaly' may not have been the most outstanding track on Mokobe's solo debut 'Mon Afrique' (2007) but the music video is something else! Hopefully it will also inspire other artists to put some humour in their videos. This one speaks for itself, even if you don't speak French. Two artists who have distinguished themselves from the generic Bongo flava-sound in Tanzania have joined up for a new single and video. 'Furaha' by Arusha-based group X Plastaz and Dar es Salaam's finest, solo rapper Fid Q, was launched in May on Channel 5 (East Africa TV) and this week across other stations and the web. X Plastaz had not recorded new material after the death of group member Faza Nelly in 2006, while Fid Q has released a couple of very succesful singles in the past months. The beat is by dj 360, X Plastaz' tour dj and producer who has also produced for the likes of Redman, Outsidaz and Freestyle Fellowship as well as Senegalese artists Wa BMG 44. The music video to 'Furaha', which raises the quality bar of hip hop videos in Tanzania, was made by Kilimanjaro Film Institute (KFI). KFI is a training institute based in Arusha which educates youth from disadvantaged backgrounds in different disciplines of filmmaking, in order to help them gain the necessary skills to find employment. The Furaha video, for which they received guidance from two Dutch film students, was a pilot project in which they were introduced to the specific discipline of making music videos. 'Mzungu kichaa' (crazy white guy) has been an expression circling in the Tanzanian hip hop scene ever since a Danish rapper called Joker did a collabo with popular artist Mr II (Sugu aka 2Proud) back in 1998. Ever since, every white man involved in Tanzanian hip hop would be referred to as 'mzungu kichaa'. In the midst of confusion about the condition of Gabon's president, and fear of any political turmoil that may break out if he passes away (update: it was just confirmed that he died indeed - we'll post any news here! ), there are two major events happening in Libreville that will make Gabon the place to be when it comes to hip hop from the central African region. First up is Gabao hip hop (see our next news update this week) and then on the 20th of June there's the annual Show du Pays. 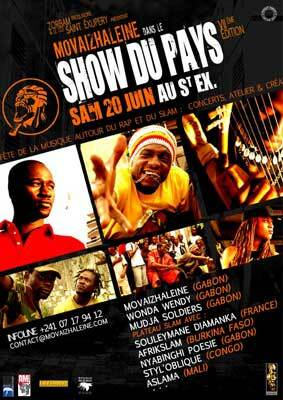 Le Show du Pays is a recurring event organized by Zorbam produxion and involves Movaizhaleine, pioneers of hip hop in Gabon who have a large following, and a large number of guest artists. This year focus is on slam, the spoken word based performance style that is pretty popular throughout the French speaking world (despite the English name). If you are in Libreville, check out the CCF (French Cultural Center), a huge and beautiful venue in the center of town next to the equally big Mbolo supermarket. Artists include Souleymane Diamanka (France/Senegal), Styl'Oblique (Congo/France), Aslama (Mali), Afrikslam (Burkina), Nyabinghi Slam (Gabon), Wendy Wenn (Gabon/France) and of course the duo of Lord Ekomy Ndong and Maat Lion a.k.a. Movaizhaleine. Ten years ago, Bisso na Bisso were the first African rap group from France to achieve major success both in France and abroad. Their 'Racines' is a true classic with its rumba/soukous inspired beats and an allstar team of emcees of Congo-Brazza birth including Passi, Ben-J, Lino and M'passi. Bisso gradually moved out of the picture but have been working on a new album to be released this year, with productions from a.o. Kaysha. The burning question to many of us would be: can they hold their own in today's highly competitive musical arena? Just take a look at the music video, shot on location in Dakar (Senegal) for a hint of what's to come. ...especially if they feature the best of South African rappers plus a video cameo by Africanhiphopradio dj Lee Kasumba! Expect an interview with dj Nana (Toronto, Canada) soon in our weekly radio show and tune in this week if you want to hear the uncensored version of this track. If you haven't subscribed yet to the podcast of our weekly 3-hour African show on Dutch national radio (don't worry - most interviews are in English and the music is universal), here's a rundown of the past months. Each show can be streamed online but is also downloadable. The third hour is usually a non-stop mix by the legendary dj Threesixty who explores all angles of black music. In the radio studio with the people behind one of South Africa's most prolific hip hop labels, Mustafa Maluka (African hip hop radio) and a phone interview with singer/songwriter Blick Bassy from Cameroon/France. Yeah... it's 2009 and we better get used to it, with people moving all across the planet you will come across unexpected cultural crossovers. Like the video owner says: 'Identify with your roots, people! Cos even others are doing that for you'. In this video, the reaction of the people standing next to him is actually more funny than the guy speaking pidgin and Hausa so well. Edit: if you're bored, go to Youtube and read the comments to this video on whether this is entertainment or a shameful mockery?